10 on the 10th: 14 Months! 1. He's turned into quite the talker. He can say momma, dada, no-no, uh-oh, dog, ball, Layla, and hello. He is starting to say "Mickey" instead of just "Key" for Mickey Mouse. He also knows that sheep say baa and dinosaurs say roar, and he babbles all day long! 2. He now knows how to get down from the couch all by himself, as well as climbing up stairs. 3. 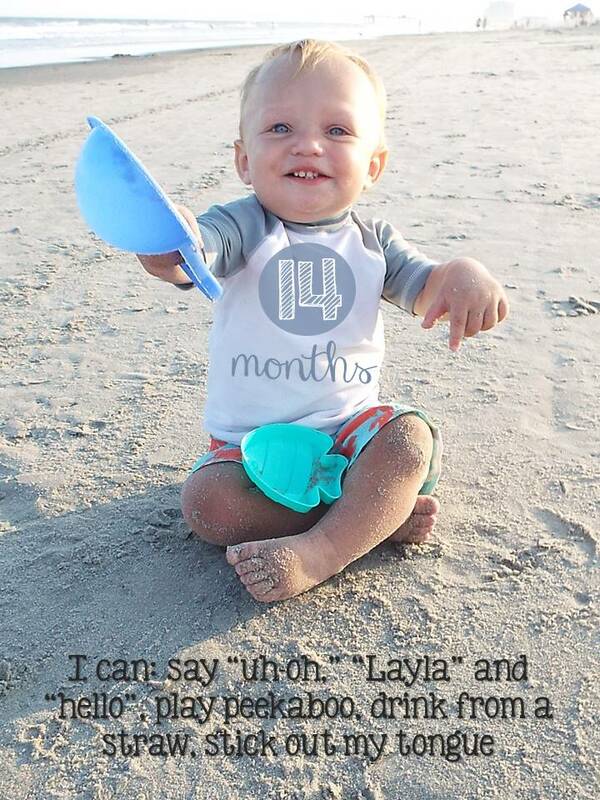 He's turned in to quite a beach baby this summer, and loves digging in the sand with his shovels. 4. Playing peek-a-boo is still one of his favorite games, and he likes to be the one hiding too, by peeking out from behind furniture, or pulling a towel or blanket over his head. 5. It took awhile, but he's now drinking water from a sippy cup! He only likes the ones with straws. 6. He prefers to do everything himself, especially when it comes to eating. The only food he doesn't like is ice cream. He'll make a sad face and spit it out because it's cold. 7. His singing soccer ball is still his favorite toy. He loves to play with it as well as snuggle with it by laying his head on it and using it as a pillow. 8. Jacob recently learned how to stick out his tongue and thinks it is soooo funny. He also gets upset if you don't stick yours out back at him. 9. He isn't walking by himself yet, but he crawls really fast, takes a few steps in between people or furniture and walks all over while holding on to his walker. 10. He now has 12 teeth! Four on top, four on bottom, and four molars in the back. We think he may be starting to get his canines in too!